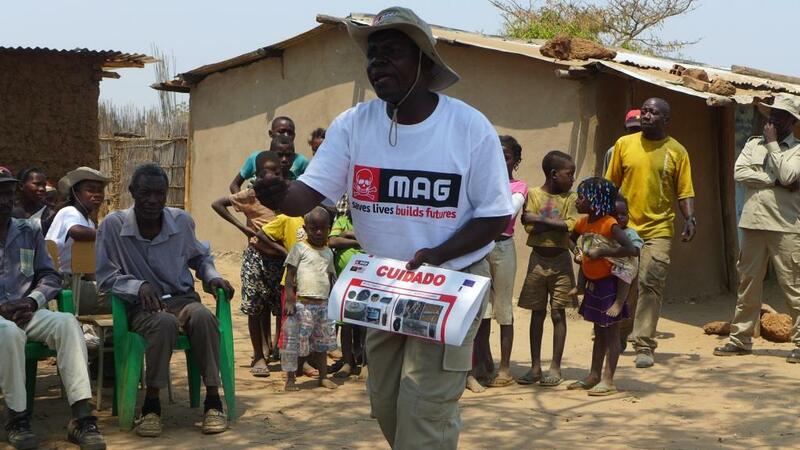 The Angola Field Group has been invited to visit Moxico province, where MAG (Mines Advisory Group), a demining organization, is headquartered. MAG has been in Angola since 1994. 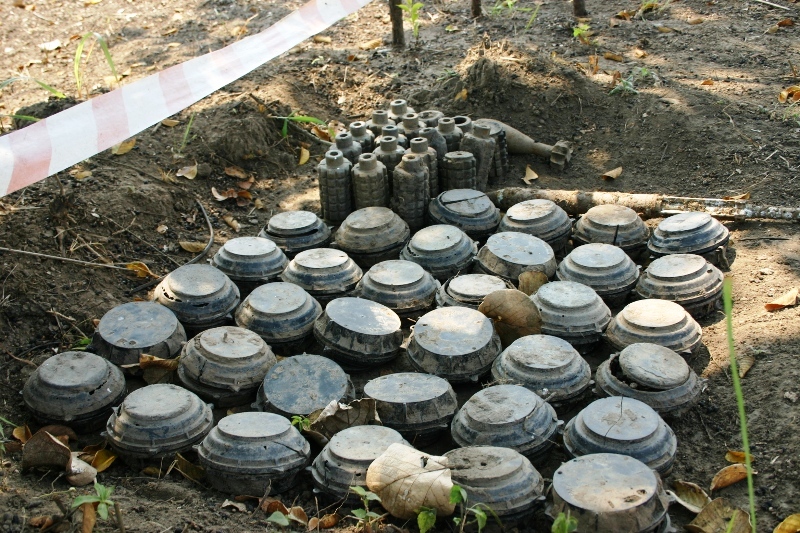 Moxico is the largest and most land mine contaminated province in the country. 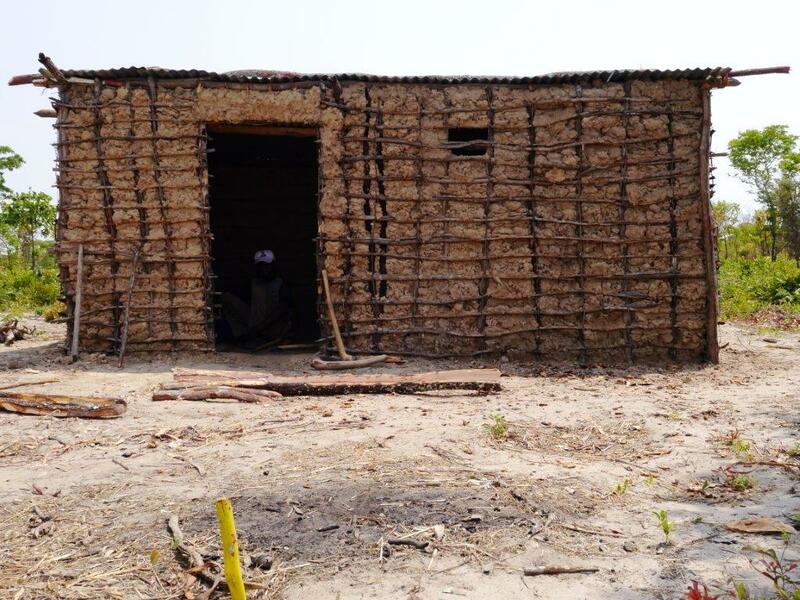 It is also home to many former refugees who continue to return and build their lives next to minefields and in close proximity to other explosive remnants of war (ERW). 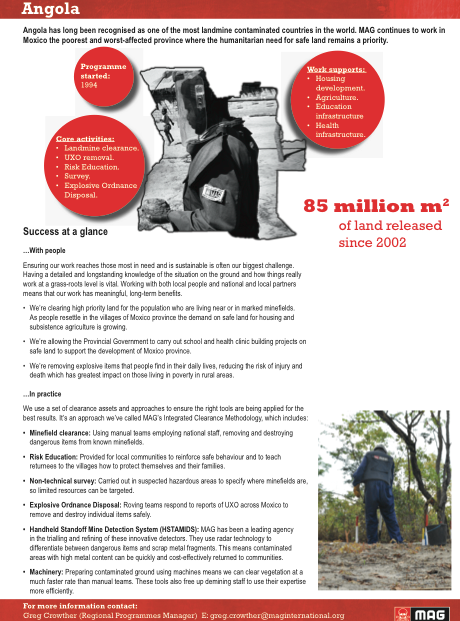 MAG has found and removed 30,000 mines and ERW since 2002, clearing and releasing over 80 million square meters of land for use in agriculture, housing, schools and clinics. 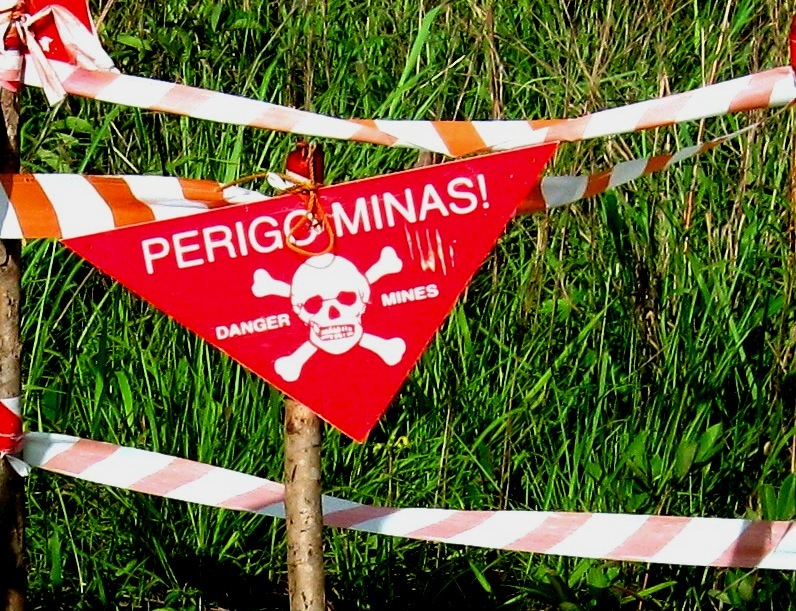 With over 400 minefields still in Moxico it is expected that it will take 20-30 more years at the current rate to complete clearance. – 1300 visit MAG campsite, about 133km from Luena, near Lucusse, the place where UNITA rebel leader Jonas Savimbi was killed in 2002 and buried. Participants will be responsible for purchasing TAAG flight tickets and transport to the Luanda airport. MAG will book the hotel rooms but each participant is responsible for paying for their room, meals, etc. MAG will pick up from and take participants back, to the airport in Luena. If you have questions or want to sign up for this field trip, please send an email to: angolafieldgroup@gmail.com – if you want to sign up include your name, nationality (that appears on passport if applicable) and telephone number. Foreigners must travel with valid passport and visa. Click here to download the MAG brochure in full size. 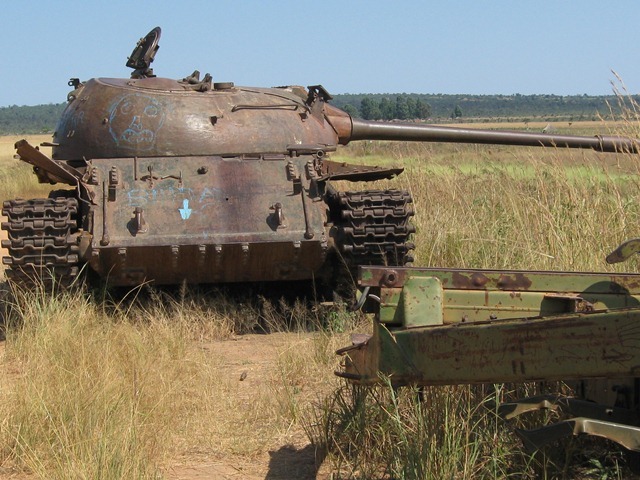 Remnants of the biggest tank battle fought since World War II, are still seen in the province of Cuando Cubango. The Angola Field Group congratulates Halo trust for receiving the two prestigious awards, see below. In April 2012 the Angola Field Group participated in a trip to Cuando Cubango to follow the source of the Okavango Delta. We were very grateful for the advice and information given to us by the de-mining organization Halo Trust. They showed us with maps what parts of the province had already been de-mined and what areas to avoid. They also took us on a tour in Cuito Cuanavale where they are presently working. Cuando Cubango is the province in Angola that has the most landmines and saw some of the fiercest fighting during the war. Thank you Halo Trust for being concerned about our safety during this fieldtrip and for the advice you offered us for the whole of our journey through this province. 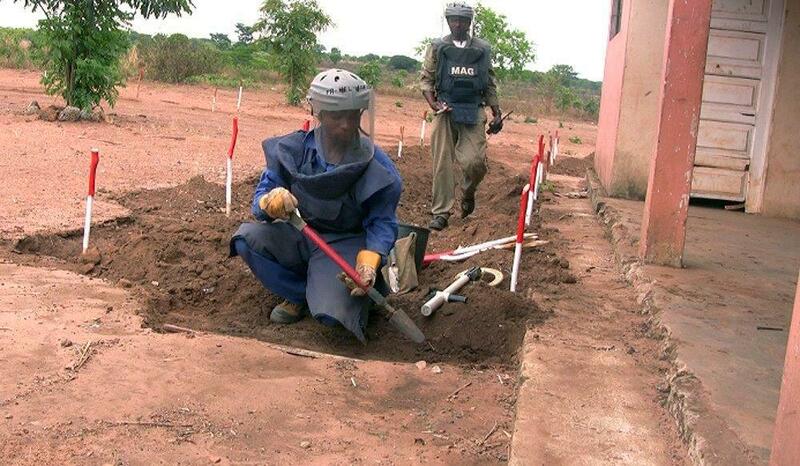 Angola Field group member treading carefully through field being de-mined by Halo Trust in Cuito Cuanaval. Tours of mine-affected areas are created for viewing in Google Earth software and narrated by Angelina Jolie, a longtime HALO supporter, taking viewers to Cambodia and Angola. 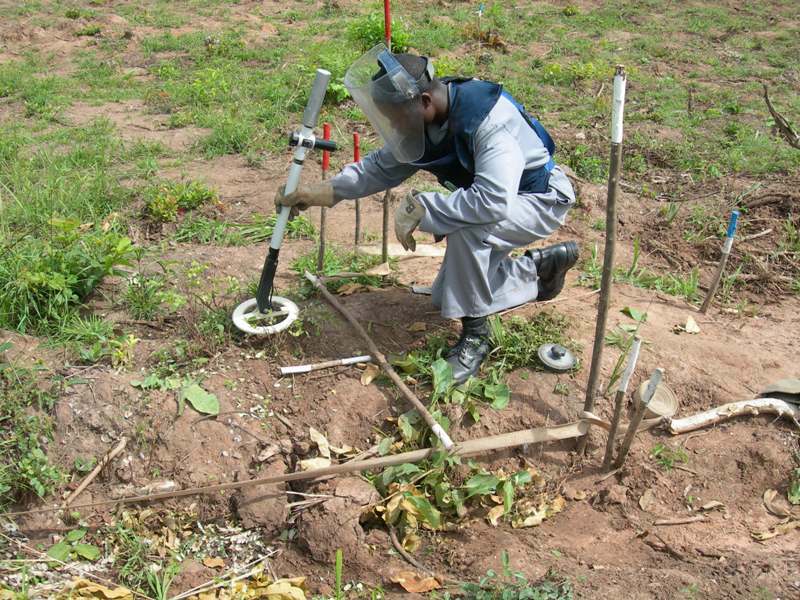 “Explore a Minefield” shows how mine clearance has allowed families to return home, land to be used for agriculture, roads to be re-opened, and children to walk to school safely – in short, communities to thrive. 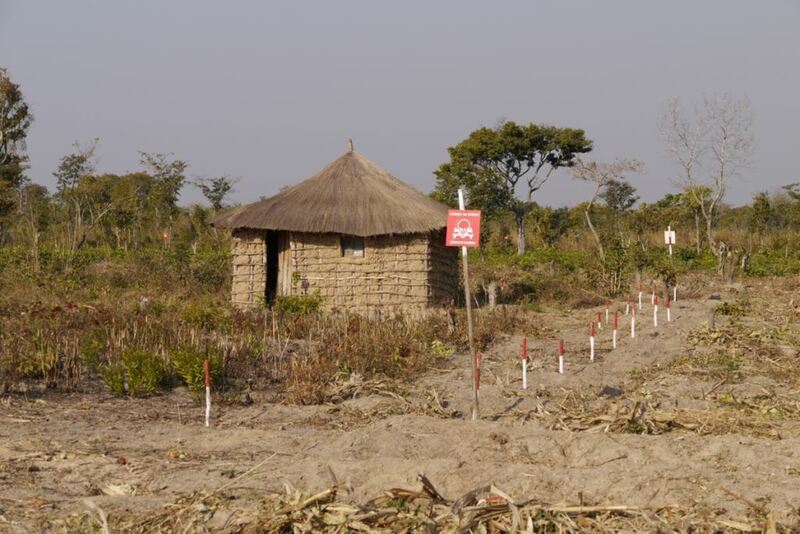 It also shows viewers minefields that remain in villages and still require clearance. At the UK Charity Awards 2012 HALO won the Overall Award for Excellence, and the category award for International Development and Aid. Halo Trust kept us well informed of the areas we travelled through in Cuando Cubango. 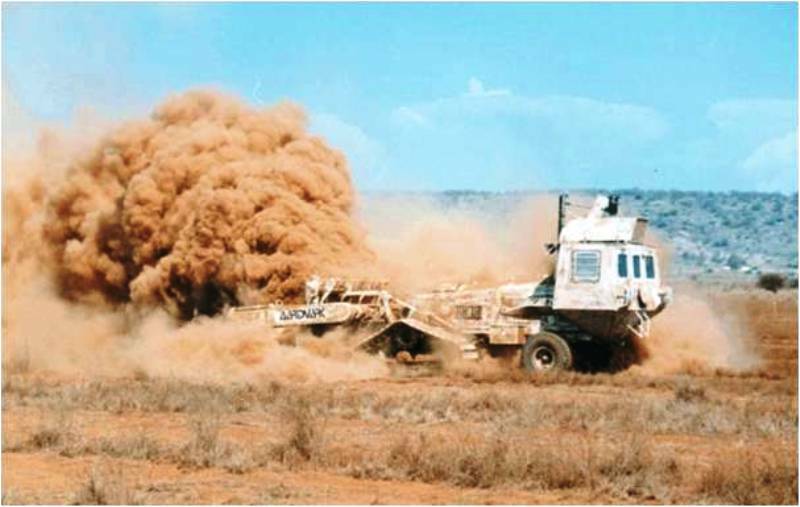 Demining machine, Aardvark. NPA photo. 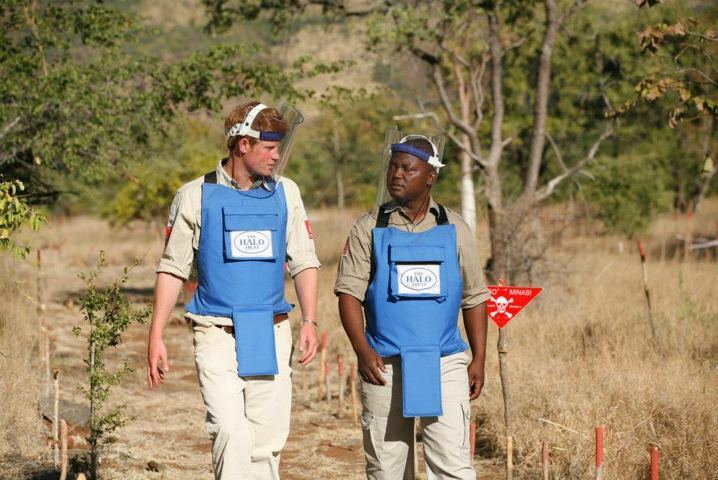 The Angola Field Group has been invited by Norwegian Peoples Aid (NPA) to get a firsthand look at demining out in the field. Slowly but surely no-go areas are being cleared in the countryside but demining and clearing explosive remnants of war, still remains a big challenge facing Angola. You can download two background info PDFs at the end of this post. 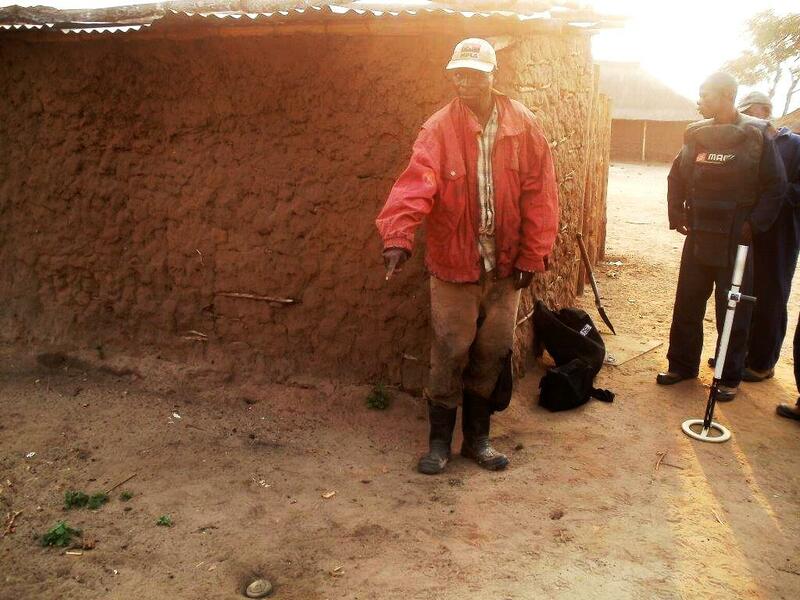 We will ‘suit up’ and join an NPA demining team in Malange, the province where this NGO is based. They will show us how mines are cleared manually and mechanically and teach us all about mine action. This is a once-in-a-lifetime opportunity and we thank NPA for making this possible. 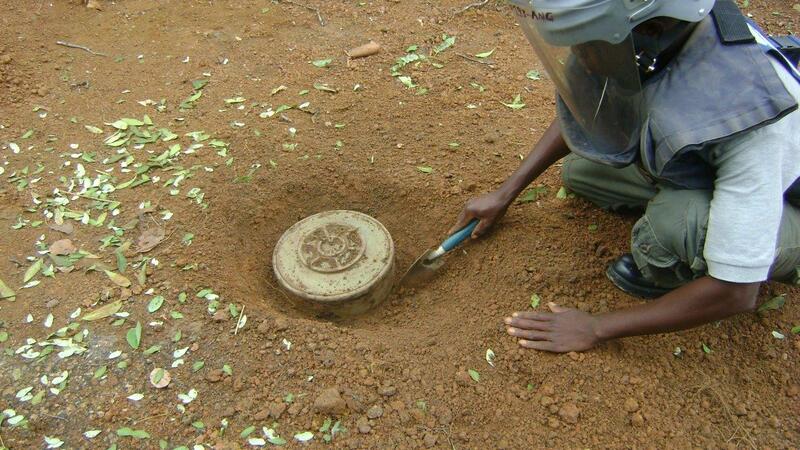 Disarming of anti personnel (ap) mine by team leader. NPA photo. 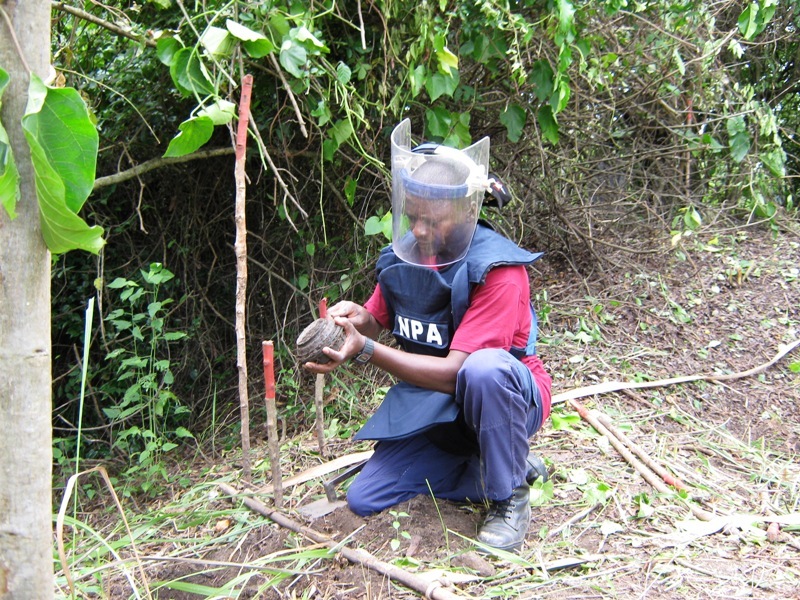 Nov. 01 – Spend the day in the field with the NPA demining team. Time permitting we will visit workshop where the traditional marimba instrument is crafted. Overnight in hotel. 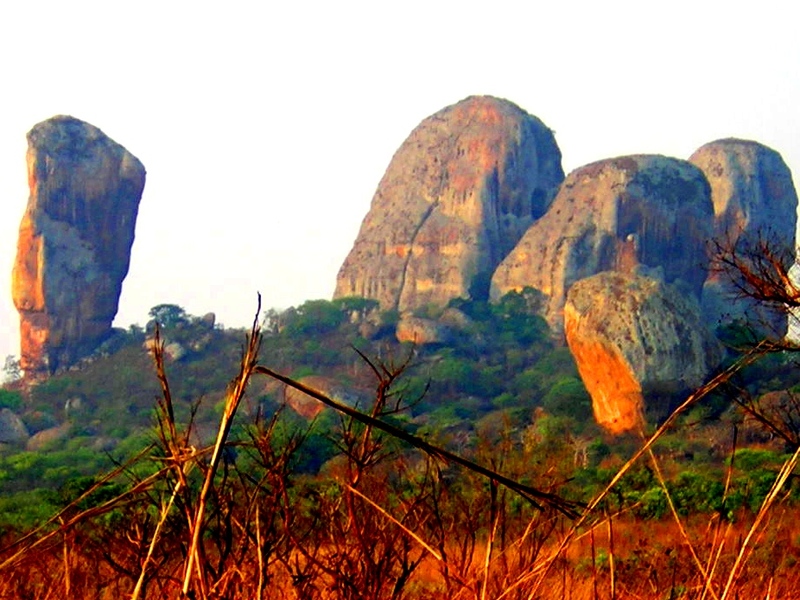 Nov. 02, Tuesday (public holiday) – Depart Malange early and head for Pedras Negras de Pungo Andongo, a colossal geological formation and get a rundown from experienced geologist Tako Koning. Then continue back to Luanda via dirt track to Dondo and then Luanda. Sorry, cannot confirm what time we will be back in Luanda. A certain number of rooms have been pre-booked at Hotel Palacio Regina in downtown Malange. The cost is $100 per night per person sharing, including breakfast. This means two people per room each in a single bed, each pays $100.00 If you want a room by yourself or there is nobody to share your room with, you pay $200.00 per night. We will be spending two nights at the hotel. All dinners will be taken in restaurants. Pack your own lunches. Most common mines in Angola / AP Mine – MAI 75 from Romania, AP Mine PPM from Germany, AP Mine T-72 from China, POMZ and POMZ 2 AP fragmentation mines from Russia and Anti Tank (AT) Mine TM-57 from Russia. NPA photo. There is a limit to the number of participants so it is necessary to sign up as soon as possible. Send an email to angolafieldgroup@gmail.com A four wheel drive is necessary for this journey. Since I have to pay the hotel in advance to hold the reservations, I will need payment for the hotel next week. You can pay me at the Angola Field Group presentation on Thursday evening, October 14, at the Viking Club. You are not confirmed for this trip unless you pay me by this date. This is a good time to ask questions also. Further details of times and meeting places, etc. will be sent to confirmed participants. Pedras Negras de Pungo Andongo at sunset. 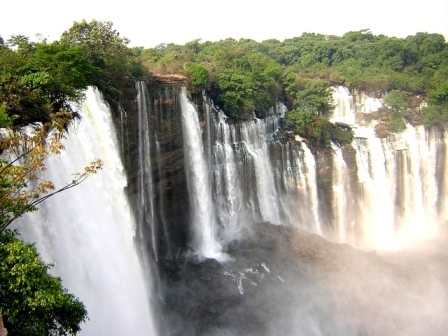 Angola is one of the world’s most heavily land-mined countries after Afghanistan and Iraq. No one really knows how many land mines are buried in Angola; top end estimates are one mine for every man, woman and child in Angola. 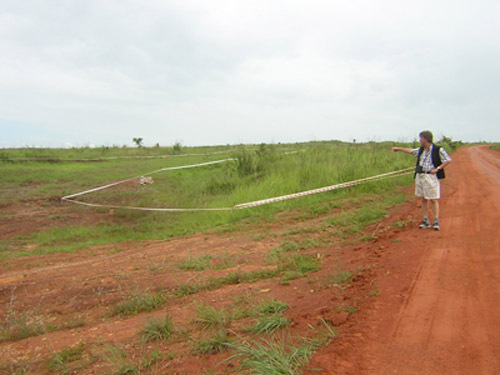 More Angolans and expatriates are now travelling outside of Luanda to explore the beautiful countryside that Angola has to offer, but land mines are unquestionably present in many parts of the country. The Angola Field Group invites you a presentation on Mines Awareness & Safety at the Viking Club, Thursday February 11, 8:00 PM. 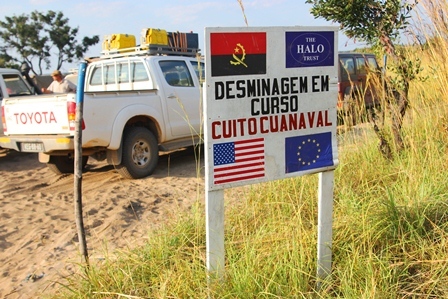 The presentation will discuss how to recognize land mines (anti-personal and anti-tank), what do do if you inadvertently drive into a land mine field and other safety aspects related to this problem which will plague Angola for years. 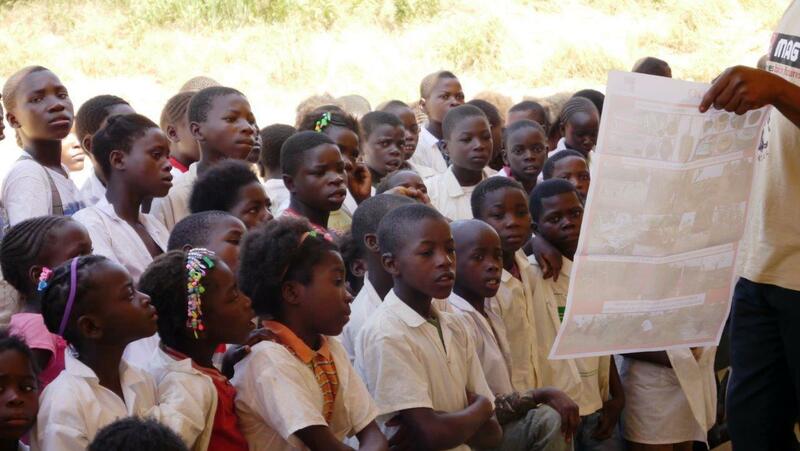 Experts estimate it will take another 14 years to make Angola land mine safe (not land mine free). Our presenter Danny Kavanagh is Country Programme Manager for MAG Angola, the organization presently de-mining in Moxico province. Danny joined the British Army at age 16 in the Corps of the Royal Military Police and served for 24 years including in Iraq. He has been with MAG for the past 5 years in Iraq, Sudan, DRC, Chad, Sri Lanka and Angola. MAG is a British-based Non Governmental Organization based in Manchester, UK, founded in 1989 and has had de-mining operations in over 35 countries. Everybody is welcome to attend this presentation. In close cooperation with the Viking Club, this event is offered free of charge. Alcoholic and non-alcoholic beverages are sold at the bar, $3.00 each. For sale, books about Angola, in English and hand woven baskets from Moxico plus other crafts produced by non profit organizations. For address and location map of the Viking Club visit this sites’s Join Us page. The Angola Field Group invites you to ‘Demining – the New Accelerated Approach’, this Thursday, May 22, at 8:00pm at the Viking Club. 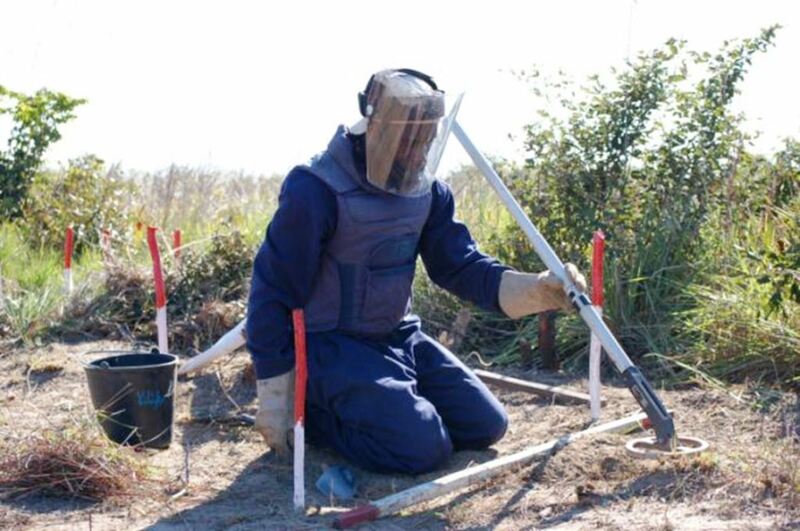 Estimates predict that it will take 50 years to clear mines and other explosive remnanats of war here in Angola using traditional methods. Our presenter, Kjersti Fjellhaug, a demining expert with Norwegian People Aid (NPA) and formerly with the Mine Advisory Group, will talk about the new scientific approach to demining that will allow NPA to get rid of the problem in the five provinces where they are working, in 7 short years. Kjersti has lived in Angola for 5 years and is presently based in Malange where she is piloting the new ‘land release’ concept using survey information. 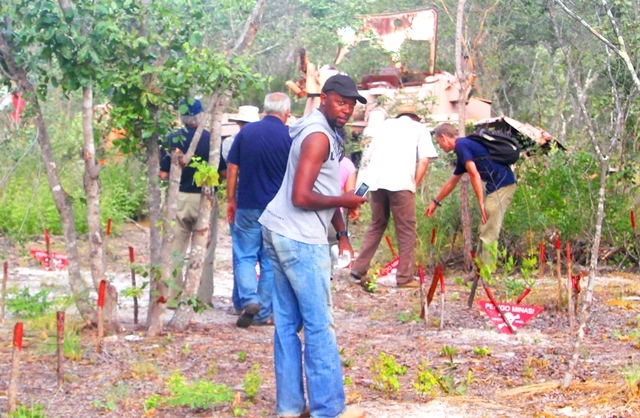 Identifying an area to be de-mined in Bie province, Angola.